A Rinkya Blog: Snake Saki Anyone? Winner of Our Weird Food Contest! Snake Saki Anyone? Winner of Our Weird Food Contest! Congratulations to Rinkya user, yougotserbed, for their winning submission to our weird food contest! 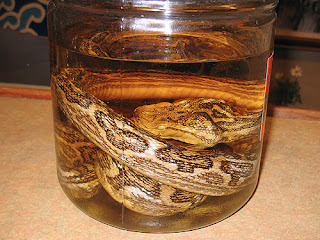 Habu Sake is distilled with the venom of a deadly snake- the habu. Very expensive bottles often include the actual snake in the sake bottle- taking the worm in tequila to a much higher level! The venom of the habu allegedly contains many health benefits for the consumer- everything from arthritis, insomnia to sexual dysfunction (the original Viagra!) is claimed to be healed by drinking some habu sake. Thank you to everyone who submitted! Yougotserbed, enjoy your Kit Kats and free commission! Order Kit Kats direct from Japan through Rinkya! Current flavors available are Caramel, Melon and White!! Shrimp & Mayo Pizza Anyone?